Supplementary webpage for the paper "A Formal Evaluation of DepDegree Based on Weyuker’s Properties"
Complexity of source code is an important characteristic that software engineers aim to quantify using static software measurement. Several measures used in practice as indicators for software complexity have theoretical flaws. In order to assess the quality of a software measure, Weyuker established a set of properties that an indicator for program-code complexity should satisfy. It is known that several well-established complexity indicators do not fulfill Weyuker’s properties. We show that DepDegree, a measure for data-flow dependencies, satisfies all of Weyuker’s properties. This webpage contains an introduction of the programming language used in the proofs (Sec. 1) and an explanation of DepDegree (Sec. 2). We use an artificial language, first described by Weyuker . We use this language because it has a simple syntax, which makes it convenient for such formal evaluations, while still exposing the same theoretical expressive power as popular programming languages (Turing completeness). The language consists of programs, which are composed of a program statement (progstmt), a body, and an output statement (outstmt). Program and output statements both have variables (vars), which are the input and output variables, respectively. A program body can be an assignment (asgn), a conditional expression, a loop, or a composition of two program bodies. An assignment sets a value, which is given by an expression, to a variable (var). An expression is either one value or an arithmetic operation (arop) applied to two values. A value may either be a constant (const) —a number— or a variable (var). We require all variables to be defined prior to their use in an expression. Instead of using a semicolon character, the two program bodies of a composition can also be distinguished by a newline character. 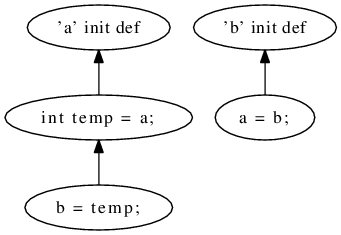 Conditional statements and loops require predicates, which are two values composed using a comparative operator (compop). For a given measure m and a given program P, we denote the measurement result m(P) by |P| if the measure m is clear from the context. Even though some of the properties are defined in reference to program bodies, we assume a definition of every variable prior to its use. In the program fragments that we use in this paper, definitions that are missing in a program body are assumed to be defined in a previous program statement that is not printed in the figure. To express that the functionality of two programs P and Q is identical, we write P ≡ Q. This means that (1) the sets of variables of the program statement and the output statement are identical in P and Q, (2) for a given configuration of input variables, the values of the output variables are identical in P and Q, and (3) program P halts if and only if Q halts. Intuitively, in the data-flow graph of the program, each program operation op has an edge back to each program operation that assigned a value to a variable used in op. The DepDegree of a program operation is the sum of such edges, over all variables and all back edges to definitions for each variable. The DepDegree of a program is the sum of the DepDegrees of all program operations (or shorter: the total number of edges in the data-flow graph of the program). Formally, we base the definition of DepDegree on a program represented by a control-flow graph G = (B,f). The graph G is a directed graph with the set F ⊆ B × B of edges representing the control-flow between program operations B . In our language (Fig. 1), a program operation can be an assignment operation with one exit edge or a conditional with two exit edges. We denote the set of program variables by X. The definition of operation dependency is derived from the notion of reaching definitions, a well-known concept in compiler design and data-flow analysis. The function reaching definition rdG = B ×X → 2B for a control-flow graph G assigns to a program operation b and a variable x a set of all program operations that define the variable x prior to b and are reaching definitions. That means there must exist a path in G from br ∈ B to b, such that br defines x and no program operation on the path from br to b redefines x. A use-def graph SG = (B,E) for a control-flow graph G is a directed graph with the set of program operations B and the set E ⊆ B × B of use-def edges. There exists a use-def edge e = (bv,bu) for two program operations bv and bu if there is a variable x that is used in bv for which rdG(bv,x) holds. So, for every edge in the use-def graph we know that there is a data-flow dependency between the program operations bv and bu, where the former is using a variable definition made in the latter. We call this graph the dependency graph. 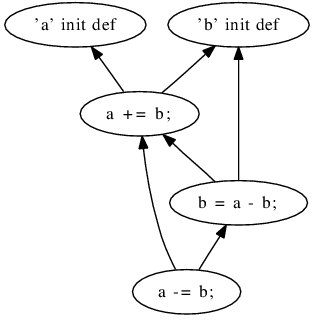 The DepDegree of a program operation b is the number of program operations that it depends on. Formally, the DepDegree of a program operation is a function ddG : B → ℕ that assigns to each program operation b the number of outgoing edges of b in the use-def graph SG, such that dd(G) = . The DepDegree of a control-flow graph G = (B,F) is defined as the function dd : G → ℕ that assigns to a CFG G the number of edges in its dependency graph S = (G,E). Formally, dd(G) = ∑ b∈BddG(b) = |E|. For a method w, we use dd(w) = dd(G), where Gis w’s CFG. DepDegree is a relatively new measure, but the results of its first evaluation and comparison to long-established measures are promising [4, 2]. A. V. Aho, R. Sethi, and J. D. Ullman. Compilers: Principles, Techniques, and Tools. Addison-Wesley, 1986. D. Beyer and A. Fararooy. DepDigger: A tool for detecting complex low-level dependencies. In Proc. ICPC, pages 40–41. IEEE, 2010. D. Beyer and A. Fararooy. A simple and effective measure for complex low-level dependencies. In Proc. ICPC, pages 80–83. IEEE, 2010. B. Katzmarski and R. Koschke. Program complexity metrics and programmer opinions. In Proc. ICPC, pages 17–26. IEEE, 2012. E. J. Weyuker. Evaluating software complexity measures. IEEE Trans. Softw. Eng., 14(9):1357–1365, 1988.